Thanks to Kirsten Hipsky, the WEBS Desgin Manager for contributing today’s tip! The Knit Stars pattern on the cover of our Holiday Catalog are quick and fun to make, but they can be a little tricky to start! To make the stars, you cast on and join 5 stitches in the round. It can be fiddly to join such a few number of stitches, so here are some suggestions to make the process go a little more smoothly. There are lots of different ways to join those first 5 stitches in the round. You could distribute them among 3 or 4 double pointed needles, one magic-looped circular needle, or even work them like an I-cord for a couple rounds until you’ve increased to more stitches. Or, if you’d rather work the whole project in rows (flat), you can do that – just cast on one extra stitch at the beginning and end of the row for seaming and purl the WS rows. You’ll just have a little more seaming to do at the end. Thanks to Kirsten Hipsky, our Design Manager, for offering us some great tips on how to avoid ladders. 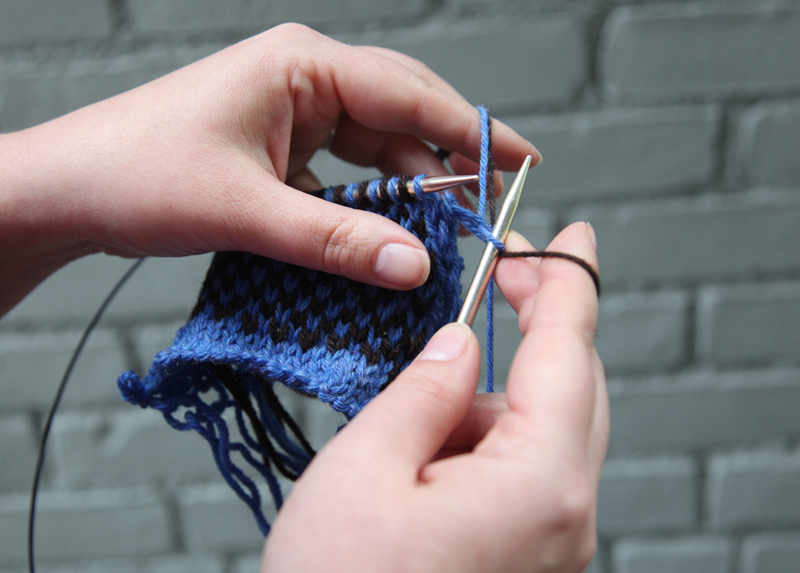 Ladders are gaps created in your knitting when using double pointed needles. They can be prevented using one of a few simple tricks. “Laddering” is definitely a common dreaded foe when working with double pointed needles. They’re essentially caused by the distance between the two needles, which is greater than the distance between the other pairs of stitches. If you purl looser than you knit, that could also result in more yarn in the gap between needles when working reverse stockinette. Here are some tips for minimizing or eliminating ladders. 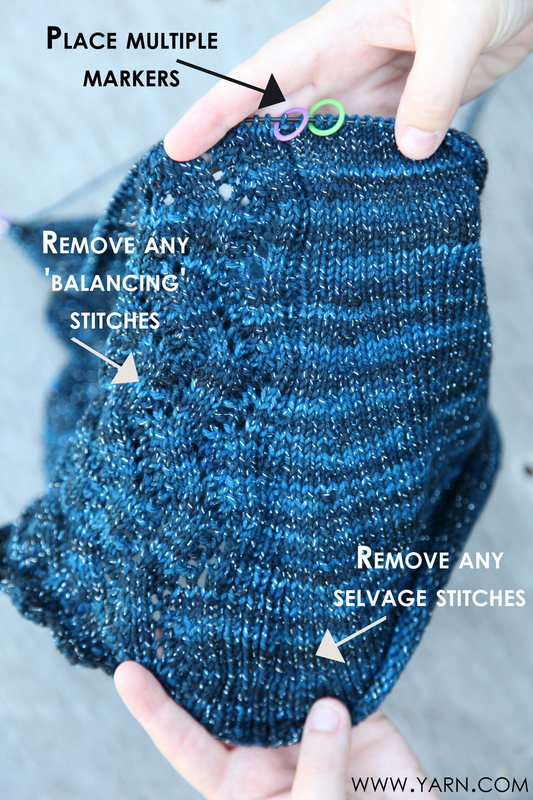 – Tighten up your stitches when moving from one needle to the next by giving the yarn a little extra tug after working the first and second stitches. 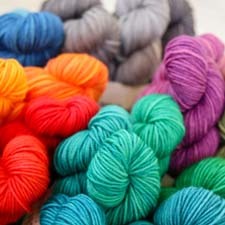 – Using a set of 5 needles rather than 4 will divide tension more evenly, keeping strain off of the stitches themselves. 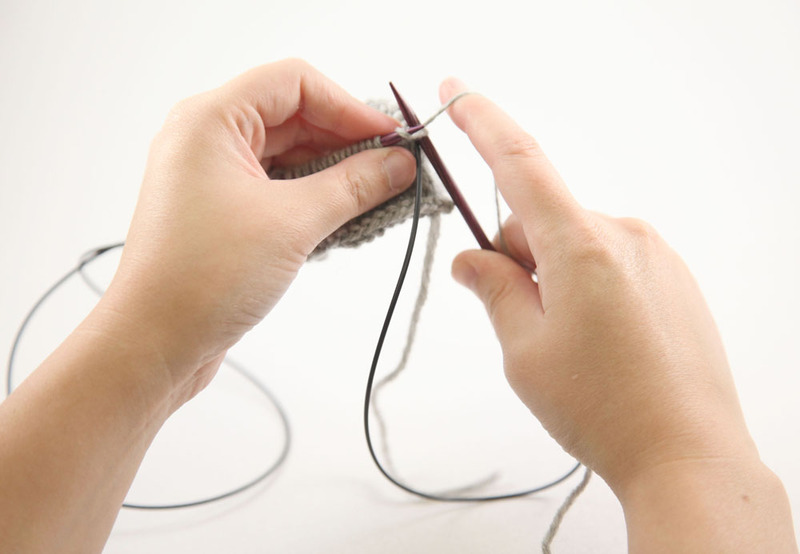 – If you’re still having trouble, try knitting a couple of stitches forward from the next needle onto the one you’ve just finished. This will shift the point of tension and help keep a vertical line from forming. – I myself have had luck eliminating ladders entirely by knitting in the round on one long circular needle using the Magic Loop method. The circular cord is usually thinner than the needle, so instead of using extra yarn at the gap between needle and cord, it just borrows some yarn from the stitch on the cord. When it comes time to knit that stitch, it expands again to fit the needle, taking up the slack. Others have also had luck using two circular needles instead of Magic Loop. How do you avoid creating ladders in your knitting? 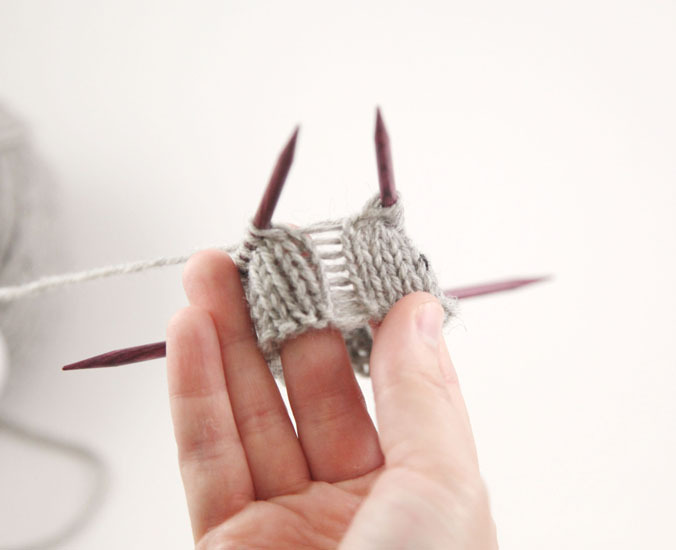 Do you have a trick, or have you stopped using double pointed needles all together? When making a gauge swatch you want to work the swatch in the same manner and on the same needles as the peice you are swatching for. If you are planning to work in the round the best way to swatch is, of course, in the round but casting on 80 stitches to swatch on a 16″ needle or working your whole sweater on double points is kind of ridiculous. Why not just cast on 4″ worth of stiches on the 24″ circular needle you’ll be using for the sweater! 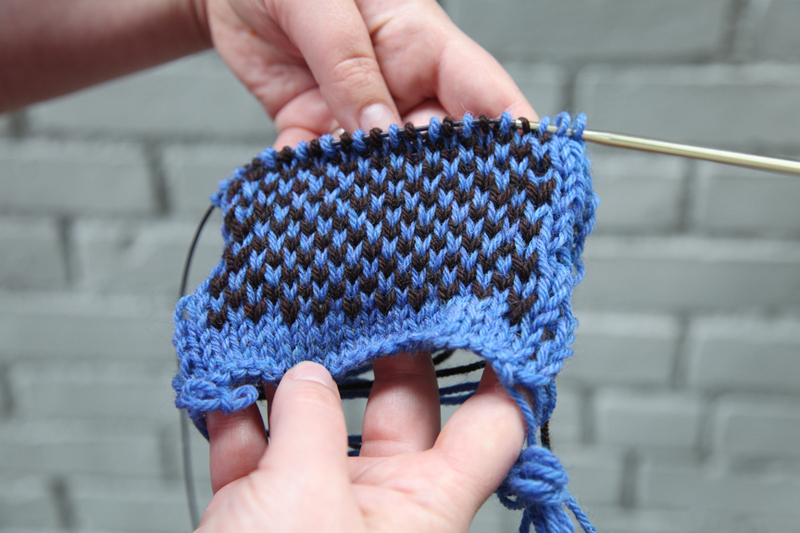 The trick is to work the whole swatch like a big i-cord. Knit across your stitches then DO NOT turn your work over, instead simply slide the stitches all the way back to the right-hand end of the needle and begin working them from right to left again. Just be sure to pull your working yarn across the back of the work nice and loose, leaving lots of slack. This will leave the stitches along either edge looking all loosy-goosy but the center stitches will truly represent your gauge as worked in the round. Thanks to Liz for providing such a simple, yet elegant knitting tip on how to deal with messy looking stripes in ribbing. I learned this trick while taking a class at WEBS. I don’t think I’ll ever forget it as it is super simple and it yields great results. If you’ve ever changed colors while knitting ribbing, you’ve no doubt noticed the unfortunate thing that happens in the purl columns. The purl bumps of one color end up showing through in the fabric of the other color, and it creates an unfortunate zig-zagging line. The good news is that there is an easy fix for this. When you change colors in ribbing simply knit all the stitches for the first round; do not purl. After the first round you can go back to your rib pattern. The result is a very clean line between the two colors. And don’t worry… You won’t even notice that round of knit stitches. They blend in completely. You can use this technique whether you are working flat or in the round. There are just a few things to take into consideration. The first is that your work must have a wrong side, since that row/round of knit stitches will appear as a garter ridge on the wrong side. As a result, this technique shouldn’t be used on reversible patterns. 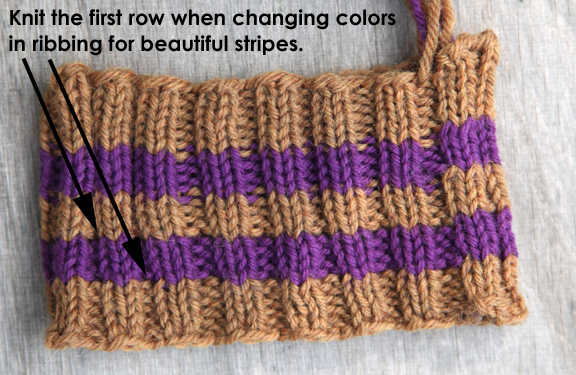 The second is that this technique works best on stripes made up of more than two rows/rounds. 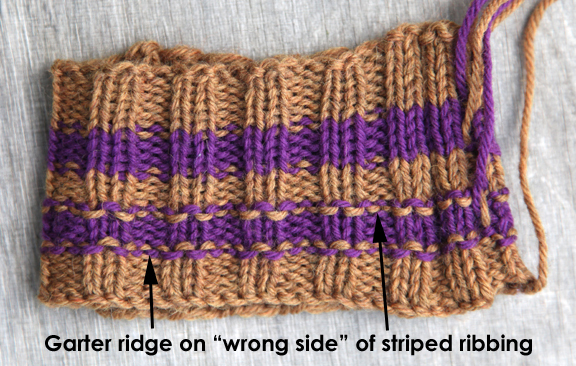 If the stripe is only two rows then you are basically going back and forth between a knit row and a rib row, and that can affect the integrity of your ribbing. If your pattern is appropriate for this technique then I suggest you try it. I think you will find, as I did, that it is a simple trick that makes a big difference. This week’s tip comes from Kirsten H. and is a simple solution for tight knitters using circular needles. If you’re a tight knitter and have problems sliding stitches from the cable to the left hand needle when working in the round on circulars, a set of interchangeable needles may be your best friend. 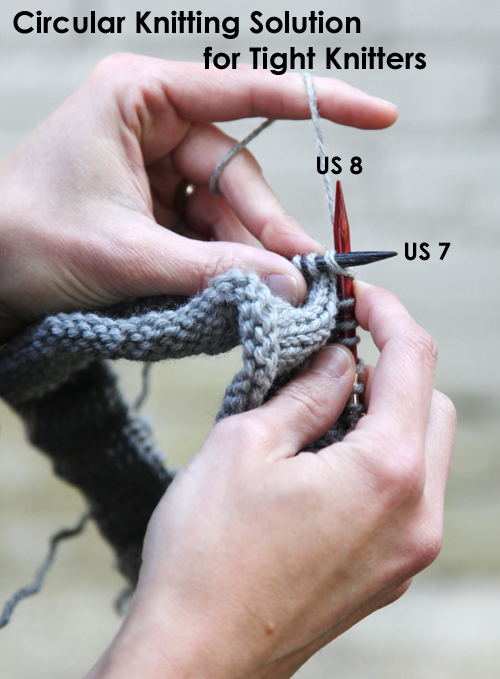 Only the right-hand needle tip determines stitch size, so you can use a smaller needle tip on the left hand side to make knitting and sliding stitches a lot easier. You may find that going down just one needle size for your left hand needle tip does the trick. But if you’re not knitting in the round, this solution won’t work. What tips do you have to help a tight knitter loosen up their gauge? 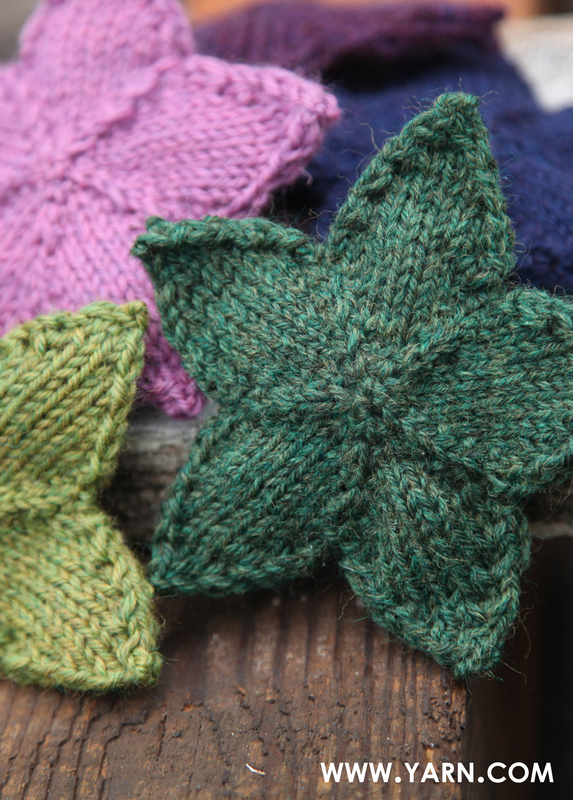 If you’ve ever knit in the round only to discover way too late that you had a twist in your cast on stitches, then you might like to try this week’s tip from Kirsten Hipsky. Work a few rows back and forth (flat) before joining in the round. It provides a much more stable fabric that’s easier to divide among double pointed or circular needles. It’s much easier to spot a twist before joining to knit in the round, saving you from having to start over. Since you’re already going to have to weave in the end from the cast on edge, you can use this tail to sew your small seam of flat knitting. Watch Kirsten’s video tutorial on How to Knit in the Round on Circular Needles for more information on this knitting technique. Have you ever twisted your cast on stitches when joining in the round? 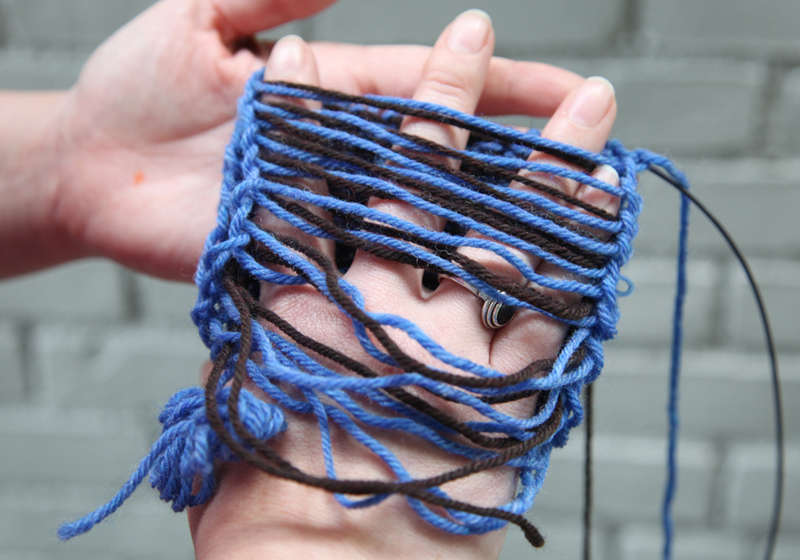 What other ways do you use to make sure you don’t have a twist when knitting in the round?